The testing of fibres was always of importance to the spinner. It is done by the HVI machine. High volume instrument systems are based on the fibre bundle strength testing, ie, many fibres are checked at the same time and their average values determined. Traditional testing using micronaire, pressley, stelometre, and fibro graph are designed to determine average value for a large number of fibres, the so called fibre bundle tests. In HVI, the bundle testing method is automated. Here, the time for testing is less and so the number of samples that could be processed is increased, quite considerably. The influence of operator is reduced. The HVI testing is attractive due to the classing of cotton and the laying down of a mix in the spinning mill. This HVI testing is suitable for the extensive quality control of all the bales processed in a spinning mill. The mill is in a position to determine its own quality level within a certain operating range. The time for testing per sample is 0.3 minutes. It is best applied to instituting optimum condition for raw material. About 180 samples per hour can be tested and that too with only 2 operators. Conventionally measurement of the fibre properties was mainly carried out using manual method and it included the maximum chance of getting errors involved in it due to manual errors and was also a time consuming job. Thus there was a need for development of an instrument capable of measuring all properties in minimum time for better cotton classification. PCCA (plans cotton cooperative association) played a key role in the development of High Volume Instrument (HVI) testing to determine the fiber properties of cotton which revolutionized the cotton and textile industries. As its name implies, HVI determines the fibre properties of a bale of cotton more quickly and more accurately than the previous method of evaluating some of those properties by hand classing. The HVI system provides more information about a bale of cotton than the subjective hand classing method. In 1960, PCCA and Motion Control, Inc., an instrument manufacturer in Dallas, Texas, began pioneering the development of a system to eliminate the potential for human error that existed with hand classing and expand the number of fibre properties that could rapidly be determined for each bale of cotton. The goal was to be able to provide seven fibre quality characteristics for every bale produced by PCCA’s farmer-owners. Laboratory instruments were available for determining most of the fibre properties, but they required up to 15 minutes or longer to determine each of the properties. The PCCA theory was based on economics: the faster cotton could be classed, the faster it could be marketed; and, the more accurate measurements of quality could result in a more adequate supply of cotton with fibre properties to meet the specific needs of textile mills. By the mid-1960s, the United States Department of Agricultural (USDA) and the Cotton Producers Institute (now called Cotton, Incorporated) also became involved in the research required to bring this concept to the marketplace. In 1968 three of the first five HVI lines were in operation in Lubbock, Texas. One line was at Texas Tech University’s International Textile Center and two at PCCA. These lines were the very earliest versions to have all seven-fibre properties combined into a single testing line and measure them in less than 20 seconds per test. In 1980, USDA built a new classing office in Lamesa, Texas, (about 60 miles south of Lubbock) specifically designed only for instrument testing all of the cotton samples received at that office using the latest version of the HVI equipment. This was a daring step but was based on data collected and analysed and improvements made in the HVI system during the previous 20 years. Although met with scepticism in the initial years by many in the cotton and textile industries, the HVI system prevailed, and USDA continued to install the instrument testing lines in all government cotton classing offices. In 1991, USDA used the HVI system on all the cotton provided to the department for classing. Today, HVI class data is accepted throughout the world and is the foundation on which cotton is traded. High volume instrument (HVI) is the most common rapid instrument testing machine made by Uster Technologies, Inc. The only other company that has over 100 machines installed in the world, mostly in Asia, is Premier Evolvics Pvt. Ltd. based in India. 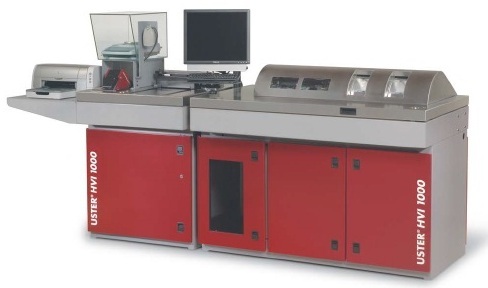 It is estimated that close to 2,000 rapid instruments testing machines have already been stalled in the world, mostly from Uster Technologies, Inc. Not only do the machines from each company differ, but various models from each company also differ among themselves. The full fledge models of both the manufacturers are capable of measuring measure micronaire, length, length uniformity, strength, colour, trash, maturity, sugar content etc. High volume instrument systems are based on the fibre bundle testing, i.e., many fibres are checked at the same time and their average values determined. Traditional testing using micronaire, pressley, stelometre, and fibro graph are designed to determine average value for a large number of fibres, the so called fibre bundle tests. 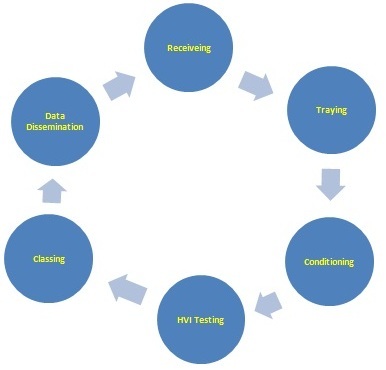 In HVI, the bundle testing method is automated. This is based on the categorizing of cotton bales according to their fibre quality characteristics. It includes the measurement of the fiber characteristics with reference to each individual bale, separation of bales into classes and lying down of balanced bale mixes based on these classes. The reason for undertaking this work lies in the fact that there is sometimes a considerable variation in the fibre characteristics from one bale to another, even within the same delivery. This variation will result in the yarn quality variation if the bales are mixed in an uncontrolled manner. The bale management software, normally embedded with an HVI, helps in selection of bales for a particular mix from the available stock. Once the data are received from HVI in the software, classification of bales in groups are done with user defined criteria. Manual calculation errors and the tedious task of day to day manual planning of mix are avoided. The storage of large number of data enables for tracking long period records or results thereby helping in clear analysis. More cost effective mix can be made since cost factor is also included. It also helps in planning for further requirements or purchase. Additional details such as party name, weighment details, and rejection details can be printed along with the test results which will be useful for the mill personnel for better analysis. Flexible intervals in grouping of bales with reference to the selected category. Basic sample results and results checked after lot arrival shall be compared graphically or numerically for easy decision making of approval or rejection. The instruments are calibrated to read in staple length. Length measurements obtained from the instrument are considerably more repeatable than the staple length determination by the classer. In one experiment the instrument repeated the same staple length determination 44% of the time while the classer repeated this determination only 29% of the time. Similarly, the instrument repeated to 1/32″ on 76% of the samples, while the classer agreed on 71% of the samples to within 1/31″. The precision of the HVI length measurement has been improved over the last few years. If we take the same bale of cotton used in the earlier example and repeatedly measure length with an HVI system, over two-thirds of measurements will be in a range of only about 1/32 nd of an inch: 95% of the individual readings will be within 1/32nd of an inch of the bale average. In the 77000 bales tested, the length readings were repeated within 0.02″ on 71% of the bales between laboratories. The HVI system gives an indication of the fibre length distribution in the bale by use of a length uniformity index. This uniformity index is obtained by dividing the mean fibre length by the upper-half-mean length and expressing the ratio as a percent. A reading of 80% is considered average length uniformity. 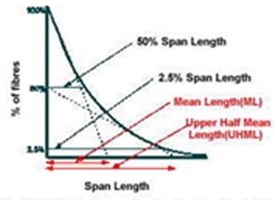 Higher numbers mean better length uniformity and lower numbers poorer length uniformity. Cotton with a length uniformity index of 83 and above is considered to have good length uniformity, a length uniformity index below 78 is considered to show poor length uniformity. The measure of short-fibre content (SFC) in Motion Control’s HVI systems is based on the fibre length distribution throughout the test specimen. It is not the staple length that is so important but the short fibre content which is important. It is better to prefer a lower commercial staple, but with much lower short-fibre content. The fibrogram sample is taken from some population of fibers. A sampled fibre will project two ends away from the holding point, such that all of the ends will be parallel and aligned at the holding point. The High Volume Instruments also provide empirical equations of short fibre content based on the results of cotton produced in the United States in a particular year. In typical fibrogram curve, the horizontal axis represents the lengths of the ends of sampled fibres. The vertical axis represents the percent of fibre ends in the fibrogram having that length or greater. HVI uses the “Constant rate of elongation” principle while testing the fibre sample. The available conventional methods of strength measurement are slow and are not compatible to be used with the HVI. The main hindering factor is the measurement of weight of the test specimen, which is necessary to estimate the tenacity of the sample. Expression of the breaking strength in terms of tenacity is important to make easy comparison between specimens of varying fineness. The strength measurement made by the HVI systems is unlike the traditional laboratory measurements of Pressley and Stelometer in several important ways. First of all the test specimens are prepared in a very different manner. In the laboratory method the fibres are selected, combed and carefully prepared to align them in the jaw clamps. Each and every fibre spans the entire distance across the jaw surfaces and the space between the jaws. Strength is measured physically by clamping a fibre bundle between 2 pairs of clamps at known distance. The second pair of clamps pulls away from the first pair at a constant speed until the fibre bundle breaks. The distance it travels, extending the fibre bundle before breakage, is reported as elongation. In the HVI instruments the fibres are randomly selected and automatically prepared for testing. They are combed to remove loose fibres and to straighten the clamped fibres, also brushed to remove crimp before testing. The mechanization of the specimen preparation techniques has resulted in a “tapered” specimen where fibre ends are found in the jaw clamp surfaces as well as in the space between the jaws. A second important difference between traditional laboratory strength measurements and HVI strength measurements is that in the laboratory measurements the mass of the broken fibres is determined by weighing the test specimen. In the HVI systems the mass is determined by the less direct methods of light absorption and resistance to air flow. The HVI strength mass measurement is further complicated by having to measure the mass at the exact point of breaks on the tapered specimen. A third significant difference between laboratory and HVI strength measurements is the rate or speed at which the fibres are broken. The HVI systems break the fibres about 10 times faster than the laboratory methods. Generally HVI grams per Tex readings are 1 to 2 units (3 to 5%) higher in numerical value. In some individual cases that seem to be related to variety, the differences can be as much as 6 to 8% higher. This has not caused a great deal of problems in the US, perhaps because a precedent was set many years ago when we began adjusting our Stelometer strength values about 27% to put them on Presley level. Because of this range in the readings within a single bale, almost all HVI users make either 2 or 4 tests per bale and average the readings. When the average readings are repeated within a laboratory, the averages are repeated to within one strength unit about 80% of the time. However, when comparisons are made between laboratories the agreement on individual bales to within plus or minus 1 g/tex decreases to 55%. Fibre fineness is normally expressed as a micronaire value (microgram per inch). It is measured by relating airflow resistance to the specific surface of fibres and maturity ration is calculated using a sophisticated algorithm based on several HVI™ measurements. The micronaire reading given by the HVI systems is the same as has been used in the commercial marketing of cotton for almost 25 years. The repeatability of the data and the operator ease of performing the test have been improved slightly in the HVI micronaire measurement over the original instruments by elimination of the requirement of exactly weighing the test specimen. The micronaire instruments available today use microcomputers to adjust the reading for a range of test specimen sizes. The micronaire reading is considered both precise and referable. For example, if we have a bale of cotton that has an average micronaire of 4.2 and repeatedly test samples from that bale, over two-thirds of that micronaire readings will be between 4.1 and 4.3 and 95 %of the readings between and 4.0 and 4.4. Thus, with only one or two tests per bale we can get a very precise measure of the average micronaire of the bale. This reading is also very repeatable from laboratory to laboratory. In USDA approx. 77000 bales were tested per day in each laboratory, micronaire measurements made in different laboratories agreed with each other within 0.1 micronaire units on 77% of the bales. The reading is influenced by both fibre maturity and fibre fineness. For a given growing area, the cotton variety generally sets the fibre fineness, and the environmental factors control or influence the fibre maturity. Thus, within a growing area the micronaire value is usually highly related to the maturity value. However, on an international scale, it cannot be known from the micronaire readings alone if cottons with different micronaire are of different fineness or if they have different maturity levels. Moisture content of the cotton sample at the time of testing, using conductive moisture probe and the main principle involved in the measurement is based on the measurement of the dielectric constant of a material. Rd (Whiteness), +b (Yellowness), Colour Grade .Measured optically by different colour filters, converted to USDA Upland or Pima Colour Grades or regional customized colour chart. The measurement of cotton colour predates the measurement of micronaire, but because colour has always been an important component of classer’s grade it has not received attention as an independent fibre property. However the measurement of colour was incorporated into the very early HVI systems as one of the primary fibre properties. Determination of cotton colour requires the measurement of two properties, the grayness and yellowness of the fibres. The grayness is a measure of the amount of light reflected from the mass of the fibre. We call this the reflectance or Rd value. The yellowness is measured on what we call Hunter’s +b scale after the man who developed it. The other scales that describe colour space (blue, red, green) are not measured becasue they are considered relatively constant for cotton. Returning once again to the measurements on our single bale, we see that repeated measurements of colour are in good agreement. For greyness or reflectance readings, 68% of the readings will be within 0.5 Rd units of the bale average, and 95% within one Rd unit for the average. As for yellowness, over two-thirds of these readings will be within one-fourth of one +b unit of the average, and 95% within one-half of one +b unit. The greyness (Rd) and yellowness (+b) measurements are related to grade through a colour chart which was developed by a USDA researcher. The USDA test of 77000 bales showed the colour readings to be the most repeatable of all data between laboratories; 87% of the bales repeated within one greyness(Rd) unit, and 85% repeated within one-half of one yellowness(+b) unit. Particle Count, % Surface Area Covered by Trash, Trash Code .Measured optically by utilizing a digital camera, and converted to USDA trash grades or customized regional trash standards. The HVI systems measure trash or non-lint content by use of video camera to determine the amount of surface area of the sample that is covered with dark spots. As the camera scans the surface of the sample, the video output drops when a dark spot (presumed to be trash) is encountered. The video signal is processed by a microcomputer to determine the number of dark spots encountered (COUNT) and the per cent of the surface area covered by the dark spots (AREA). The area and count data are used in an equation to predict the amount of visible non-lint content as measured on the Shirley Analyser. The HVI trash data output is a two-digit number which gives the predicted non-lint content for that bale. For example, a trash reading of 28 would mean that the predicted Shirley Analyser visible non-lint content of that bale would be 2.8%. While the video trash instruments have been around for several years, but the data suggest that the prediction of non-lint content is accurate to about 0.75% non-lint, and that the measurements are repeatable 95% of the time to within 1% non-lint content. Calculated using a sophisticated algorithm based on several HVI™ measurements. Near infrared analysis provides a fast, safe and easy means to measure cotton maturity, fineness and sugar content at HVI speed without the need for time consuming sample preparation or fiber blending. This technology is based on the near infrared reflectance spectroscopy principle in the wavelength range of 750 to 2500 nanometres. Differences of maturity in cotton fibres are recognized through distinctly different NIR absorbance spectra. NIR technology also allows for the measurement of sugar content by separating the absorbance characteristics of various sugars from the absorbance of cotton material. NIR maturity and dye uptake in cotton yarns have been shown to correlate highly with maturity as measured by NIR. A correlation of R=0.96 was obtained for a set of 15 cottons. In a joint study by ITT and a European research organization, 45 cottons from four continents were tested for maturity using the NIR method and the SHIRLEY Development Fineness/ Maturity tester (FMT). For these samples, NIR and FMT maturity correlated very highly (R=0.94). On 15 cottons from different growth areas of the USA, NIR maturity was found to correlate with r2 = 0.9 through a method developed by the United States Department of Agriculture (USDA). In this method, fibres are cross-sectioned and microscopically evaluated. Sugar Content is a valid indicator of potential processing problems. Near infrared analysis, because of its adaptability to HVI, allows for screening of bales prior to use. 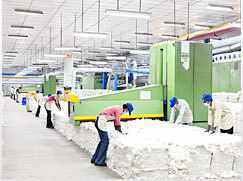 The information serves to selected bales to avoid preparation of cotton mixes of bales with excessive sugar content. Cotton stickiness consists of two major causes- honeydew form white flies and aphids and high level of natural plant sugars. Both are periodic problems which cause efficiency losses in yarn manufacturing. The problems with the randomly distributed honeydew contamination often results in costly production interruptions and requires immediate action often as severe as discontinuing the use of contaminated cottons. Natural plant sugars are more evenly distributed and cause problems of residue build-up, lint accumulation and roll laps. Quality problems created by plant sugar stickiness are often more critical in the spinning process than the honeydew stickiness. Lint residues which accumulate on machine parts in various processes will break loose and become part of the fibre mass resulting in yarn imperfections. An effective way to control cotton stickiness in processing is to blend sticky and non-stick cottons. Knowing the sugar content of each bale of cotton used in each mix minimizes day-to-day variations in processing efficiency and products more consistent yarn quality. Screening the bale inventory for sugar content prior to processing will allow the selection of mixes with good processing characteristics while also utilizing the entire bale inventory. The relationship between percent sugar content by NIR analysis and the Perkins method shows an excellent correlation of r2=0.95. The amount of reducing material on cotton fibre in the Perkins method is determined by comparing the reducing ability of the water extract of the fibre to that of a standard reducing substance. Using the NIR method, the amount of reducing sugar in cotton is measured. The results are practically independent of the operator. The results are based on large volume samples, and are therefore more significant. The time for testing per sample is 0.3 minutes. The respective fibre data are immediately available. About 180 samples per hour can be tested and that too with only 2 operators. The data are clearly arranged in summarised reports. They make possible the best utilisation of raw material data. It is best applied to instituting optimum condition for raw material. Problems as a result of fibre material can be predicted, and corrective measures instituted before such problems can occur. The classing of cotton and the laying down of a mix in the spinning mill. This HVI testing is suitable for the extensive quality control of all the bales processed in a spinning mill. The mill is in a position to determine its own quality level within a certain operating range. All offices are required to select known-value cotton samples and perform stringent and consistent performance evaluations, before machines can be placed into production. Approximately 1% of entire crop is selected from each field office for retest in “QA” as Check lots. Check lot data is returned to classing offices quickly for review. Check lot system assists in monitoring office performance and ensuring proper testing levels. Testing laboratories are required to maintain conditions of 70°±1° F and 65%±2% RH. All cotton must stabilize at moisture content level of 6.75%-8.25% prior to HVI testing.